- Includes Minimum NVH, negative ion air quality system, and high-adaptation suspension that significantly reduces vibration for a smoother drive on level roads. 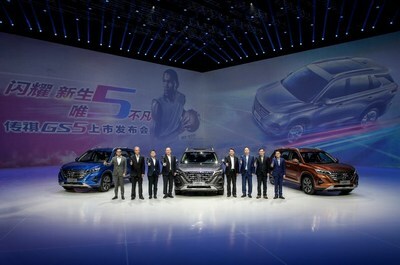 GUANGZHOU, China, Nov. 2, 2018 /PRNewswire/ -- GAC Motor, China's leading automaker, has released its newest, most comfortable and technologically-advanced medium- to high-end SUV, the GS5, at a product launch event held at the Asia Games Town Gymnasium in Panyu District, Guangzhou. First unveiled at the recent Paris Motor Show, the GS5 has already made a huge impression with its stunning appearance and emphasis on driving comfort. The GS5's design specifically caters to young consumers living in cities, offering a balanced driving and riding experience that fulfills consumers' needs for practical utility as well as creating personal value by achieving a sense of premium appeal. 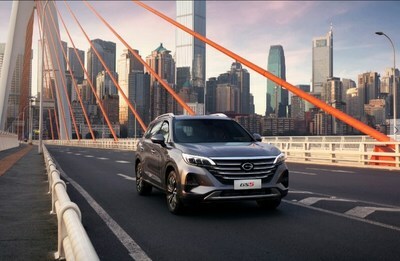 Powered by GAC Motor's new generation of car-building technologies, the GS5 SUV is a benchmarking creation that combines rideability and advanced technologies, typifying GAC Motor's pursuit of manufacturing excellence. Developed using GAC Motor's Cross-platform Modular Architecture (G-CPMA), the GS5 utilizes new third-generation "Ti Power" to achieve a perfect balance between stability and comfort. Features six technical innovations including continuous variable valve timing, patented GCCS combustion control technology and Bosch high-pressure injection system. The GS5 features an upgraded, high-performance driving chassis. 2.38 dB minimum-in-class pulse vibration. GAC Motor has leveraged its global supply chain system to create world-class products. For example, the compressive capacity of the GS5's roof is far beyond the most stringent U.S. regulatory limits, and the model's five-star enhanced safety package comprises ten smart driving safety guarantees. The GS5's forward-leaning stance is represented by the brand's iconic 'Flying Dynamics' front grille that forms a bold and cohesive structure while spreading its wings into both of the diamond-cut LED matrix headlights to create the impression of taking off. The body of the GS5 features a suspended roof design and stunning 19-inch machined rims. The dynamic model also boasts rear smart skyline LED run-through taillights and roaring chrome-plated double exhaust pipes. The GS5 offers best-in-class cabin space both in the front and rear while enhancing the joys of driving with a panoramic sunroof and Qiyun AI mobility solution. Some of the GS5's functions are remote-controlled, such as activating the onboard triple air purification function with a simple tap of a smartphone. The GS5 is the latest achievement of GAC Motor's integrated global supply chain; it's a strong player in the compact SUV market sector and is destined to be a future star of the GAC Motor family after the GS4 and GS8. Founded in 2008, Guangzhou Automobile Group Motor CO., LTD (GAC Motor) is a subsidiary of GAC Group which ranks 202nd among Fortune Global 500 companies. The company develops and manufactures premium quality vehicles, engines, components and auto accessories. GAC Motor has now ranked first among all Chinese brands for six consecutive years in J.D. Power Asia Pacific's China Initial Quality Study SM (IQS), demonstrating the company's quality-centric strategy from innovative research and development (R&D), manufacturing to supply chain and sales & services.